I'm 42 years old and I'm mushing since 1994, I'm married with my wife Barbara and we have two children, Salome and Luzia. 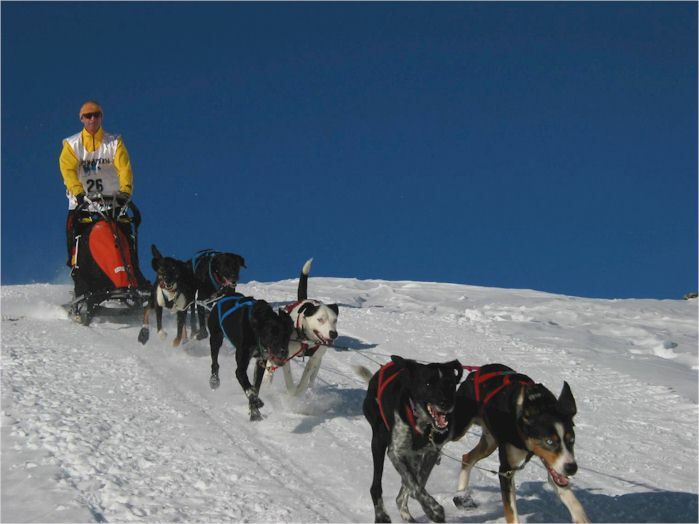 I'm the president of the SSBW which is organizing the Sleddog races in Todtmoos every year (WC 94 and 2003). Years before I worked together with Bernd Weschle (BEWE-Sleds) and since 7 years I have my own business in welding. I'm running dogs mostly for Mid-distance and one of the season highlights every year is the Stage race, Alpen Trail in the Alps. 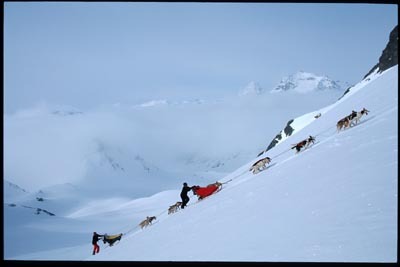 I�m working with sleddogs since 1994. 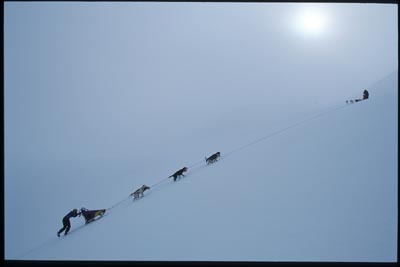 The time I start to work with sleddogs I worked together with Bernd Weschle and Fritz Dyck (BEWE-Sleds and Dyck Training carts). 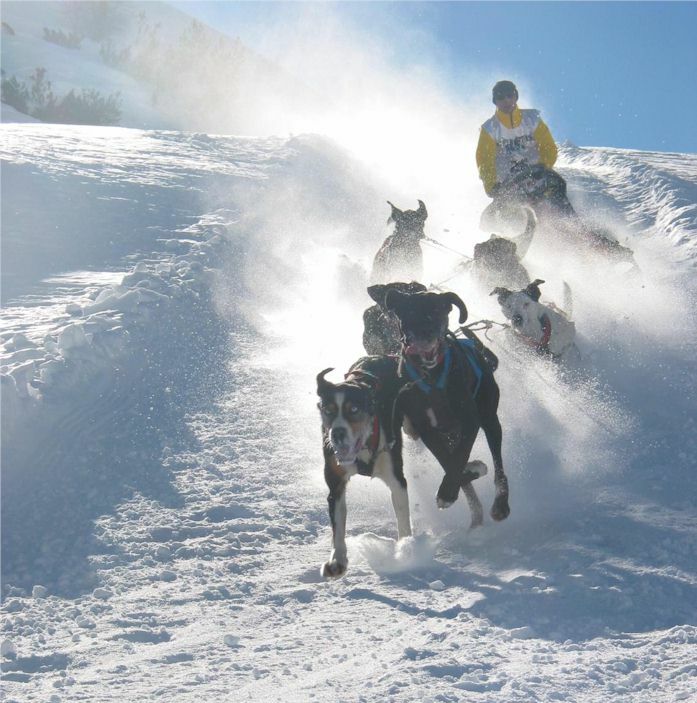 I don't remember my very first time behind a sleddog team but I'm wondering why I'm still alive after so much trouble I had in the beginning. I started with an Alaskan puppy and a show-Siberian Husky with the bike. In the beginning I had a few mentors. Bernd Weschle and a few other Mushers around my Home place. After about 3 years Volkmar Stuber, Heini Winter, Lutz Binzer told me a lot of handling dogs in another way I had done before. 1995 I meet Egil Ellis and Helen Lundberg the first time. We bought our first 2 Ellis dogs then and so we were one of the first Mid-European with have Ellis dogs. My kennel is big enough for 12-14 dogs. I prefer a small kennel. Of course I have to do all of the work alone together with my wife Barbara. I'm training always one team. The time I was Vice EC in the 8 Dog-class I trained 7 Dogs the whole season. 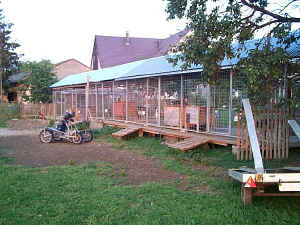 The dogs are in a fenced Kennel, only 2 dogs together with wooden platforms with a roof over all. Our dogs are all used to be in the house too. Sometimes I take them inside instead of training to keep them and me happy. I'm feeding a dry food all through the year. In training and racing I give a little fat extra but no other things at all. I only have males in the kennel and most of them are out of Ellis lines. Since a few years I have dogs out of breedings with my dogs in the kennel and most of them are doing well. A few Mushers which are interested in MD have bred with my dogs and so I have some dogs with different dogs of the mother side in the team. The most important thing for me is a friendly and social dog. The summertime I'm walking and biking with the dogs and so I have to look that all dogs are under control when I'm doing this. One of my favorite dogs is Sigge (Sigfried). He is now 7 years old and always friendly and he is the prototype of a really good and friendly dog which you can run at a race like a car with a gearbox. Petter is an other one. He is running most of the main races in lead and he has produced a lot of really good and friendly and non-shy pups. On this place I could try forward up for all my dogs. Every dog has his own special character !!! I think you couldn't see what's a good sled dog before you run them one season. The only thing we do is to keep them happy and run free with them. I try to go to the village, and to different people with them to teach them to be together with people and other dogs or other animals on different places without of stress. In the beginning I take them in the team for a short distance (almost in spring) and after they can run free next to the team. I take the dog in the team and I have to feel if it takes ok for the dog or not. The musher have to feel what's the necessity of the dog not of the musher! In summer I work a lot with the dogs and teach them to look to me. The dogs have to focus on me!! Biking with the dogs (10-40km). Dogs running loose beside me!!!! I think 80% for success or not is the motivation of the dogs. At all trainings I playing with them and in 98% of all traings and races I don't use meat or other goodies to reward the dog. A tennis ball or other things to play is very much more than a goody. Normally MD Races. 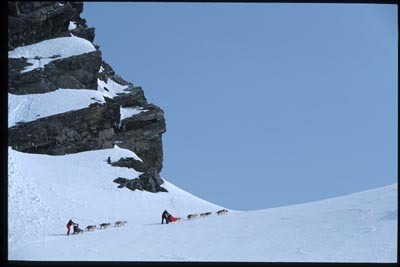 If its possible The WC Bend 2005, next season looking into the Long-distance races in Canada/Alaska. I think to keep the dogs happy and have the right feeling how the dogs are. To defend the WC title in Bend 2005, Wyoming Stage Race?? 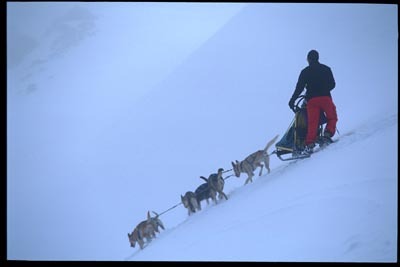 Hope that all mushers take care of their dogs and work together (purebred and open) in order show the world how wonderful it can be to work together with animals.